"This was my Nana's homemade frosting and everyone loves it! So I'm now sharing it with all of you so you can enjoy it also. It can easily be flavored and colored with extracts or food coloring." Pour milk into a saucepan, and bring to just a simmer. Be careful, if it starts to boil, it will quickly boil over. Meanwhile, combine the shortening, margarine and sugar in a large bowl, and beat with an electric mixer until light. When the milk is heated, gradually drizzle in the hot milk, while continuing to whip until light and fluffy. 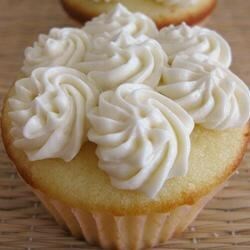 I used butter instead of margarine and shortening and this frosting tasted sooo good and was wonderfully fluffy. I will be using this recipe for the rest of my life!